These cages, our brooders and incubators are made from an 18 mm shutter plywood. It is designed and used to withstand multiple applications of tons of wet concrete over a long period of time in the construction industry. To this plywood we still apply a top quality marine varnish, thus giving ourselves and our clients peace of mind knowing that they will look good and be serviceable for many years. 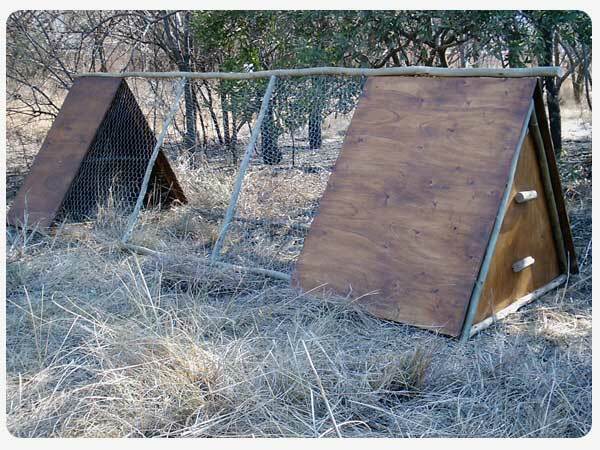 The bush cage is 3.00m X 1,00m X 1,20m high. It has a hinged wire door in the middle and the the one end drops open to allow the birds freedom to the outside world and you access to both eggs & chickens. Opening Nest-side ViewCleaning is also made easy from this entrance. The breeder cage is 2,150 X 1,10 X ,700 High. These are the most popular sizes. BUT, remember we make up to your requirements... with NO additional premium added for "non standard" sizes! We make our cages to our customers specifications! This cage is an attractive version of its all steel counterpart. It is designed for indoors use and has a removable galvanized iron tray which slides out for cleaning. The droppings can then be added to the garden or compost heap. The jumbo quails are also then given safe access to the lawn due to a wire mesh bottom. An additional feature is rope handles – An economy wise option. Or a wheels option, the large fitted wheels enable one person to effortlessly move cage and birds from a concrete floor to anywhere in the garden. Our nest boxes and Econo brooders are constructed out of recycled timber & board to reduce both the carbon footprint and the cost to our clients! These are stacked showing the front & rear view. With the ventilation gap at the back and the egg bar in front. The two wooden base strips, on the bottom of the box not only keep the nest off the ground but when stacked reduces heat build-up by allowing air to circulate between nests. They can be stacked singly on the ground or this way in hen houses but with wooden ramps – which we also manufacture -leading to the higher boxes. It is far better practice to place them this way as it reduces bickering and affords the hens privacy too. If placed against a wall ensure that there is a space of at least 100mm between the wall and ventilation slot to prevent the bird from overheating. Excessive heat will discourage the hen from using the box and can be fatal too. This size nest is large enough to accommodate 5 to 6 laying hensVeld grass or straw makes excellent bedding, but must be changed regularly to prevent parasite and bacteria build up. Bacteria can enter through the egg shell, which can be a health hazard plus it can kill the embryo in fertilized eggs. Do not use wet or green grass as this can generate heat and mould in the nest. Basic Brooder: An excellent entry level brooder. Any number of attachments used in the Advanced Brooder may be added to upgrade this unit at any time. The brooder is divided into two equal sections with 2 top opening independent double doors vented with predator proof 12mm X 25mm welded mesh. Plus double front opening independent doors, bottom hinged to facilitate cleaning & disinfecting. Fitted with 3 per side 60 watt spotlights & one per side energy saver light. Built with Shutterply and coated with marine varnish. Complete with plug & 3,00m of wire. Planned as wall hanging ( rawl bolts supplied ) OR free standing off the floor unit. This brooder is designed for the more moderate climates where temperature variants are not a major problem. It is also the least expensive of our range. Advanced Brooder: This brooder has all the above features. But in addition we have included the following: 2 Thermostats .One per side allowing one section to be used independently from the other. 2 X 3 Pole switches allowing the user to further control the temperature by switching the heating spotlights on or off as required without altering the thermostat settings. This is helps to reduce electricity cost as the chicks grow and require less heating! 2 X 100mm Exhaust fans, one per side. This is particularly useful in areas with high temperatures where the internal temperature and / or humidity builds up excessively. We supply an optional accessory in the form of an automated switch, which works in the reverse way to that of a thermostat, switching the extractor fans ON when the temperature reaches excessive highs. A digital thermometer with a probe extending to both sides of the brooder! Size of both models: ,620 X 2,440 X ,490 High. This is the most popular size. But again, we can tailor make one for you! They have capacity of 90 quails or 40 fowl chicks per side, up to the age of around 3 weeks old. The Start up brooder, was initially designed and developed for the small scale breeder. This unit compliments our MiniInc beautifully! As the demand for larger economical brooders grew we came to realize that we could adapt our design to accommodate these needs. As with all of our products we now make this brooder according to our clients size & budget requirements without additional costs for tailor made units! An automated energy saving weather proof light to maximise laying in both fowls and quails. Enables you to check fertility and viability of your eggs during certain stages of embryo development. It is also possible to see unwanted bacteria forming which kills the embryo. This type of information helps the breeder reduce egg loss, infertility, incubator space etc. These are stackable plywood trays treated with marine varnish to enable easy disinfecting. They maximise ease of collection and daily "turning" of your eggs, while reducing the possibility of breakages. A "white board" section for record purposes is added to each tray. We also make vermin proof trays on demand. PS They are also "cat proof".... Providing your dear little kitty does not know how to knock the whole tray to the floor!!! Dog proof ??? Naah! We gave that up as a bad idea! They outsmarted us every time!! Various sizes available depending on requirements. Separate trays for quail or fowl eggs available! This alarm is also designed and made by ourselves to!. It is in constant use on the farm to protect both incubated eggs and chicks in brooders or hatchers. It simply gets plugged into any 15 Amp wall plug and the alarm will sound when the power goes off allowing you to connect up a generator. It is capable of taking a buzzer alarm for indoors and / or an outside siren. A light may be connected too!